I'm sitting there with three tubes of kraft paper, a ball of twine, two dwindling rolls of tape, and a small mountain of presents to wrap. Fat, juicy raindrops are pelting the window panes. Wind is making the bones of the house creak, and I suspect it will be dark by 3:30 this afternoon. There is a pot of day-old red posole bubbling away over a low, low flame in the kitchen. Which, by the way, is the warmest place in the house right now. I'm eager to pick through the pot to procure more than my fair share of flowered kernels. Kernels I'll then hide under thin whisps of pan-fried tortillas, a pinch of toasted Mexican oregano, and a bit of crumbled feta. It will be just the right thing to have for lunch on a day like today. I've had posole on my mind for weeks now. And this is just one of a series of posole-centric pots I've cooked up since my friend Gwen brought a huge pot of posole verde and all the fixings to a big family-syle dinner we had at Lori's house in Napa - you might remember Lori from the posts I've done about her cabin. Hi Lori, hi Lisa, hi Gwen :) The posole that night? It really hit the spot. Gwen mentioned using the posole verde recipe on the Rancho Gordo site, but tomatillos are scarce right now, so for this pot I went the red route. I started with Deborah Madison's posole recipe from Vegetarian Cooking for Everyone, which essentially gives you a base recipe for cooking posole/hominy. You then add her chile colorado style red sauce (to taste), which takes the posole into the red realm. I've adapted the recipe to combine the two components, and incorporated a few personal tweaks as well. You'll find posole is quite adaptable, so really, just season and make changes based on what tastes good to you. It is worth mentioning, you'll end up with plenty of extra red sauce. Not a bad thing because it actually freezes well, as does drained pozole/hominy. So, while I don't normally think of pozole as an on-the-fly weeknight meal, if you have two of the components in the freezer, you can thaw them earlier in the day, and be ready to go, relatively quickly, later in the evening. I'm just noticing that there aren't many popped kernels in the lead photo. There were plenty, but I must have spooned them all into my bowl! Merry Christmas & happy holidays everyone. Look for ready-to-cook hominy - the kind you soak overnight, and then cook. A lot like you would beans. I used Rancho Gordo white corn posole, but there is also a thread on Chowhound on how to source ready-to-cook posole As far as the choice of chile peppers goes, I used dried red New Mexican chiles, they have mild heat and aren't overly intense. You might also try guajillo chiles, or if you don't mind a bit more heat, Aji Amarillo chiles with their fruity overtones might be nice. Or maybe try a blend of mild-ish chiles. 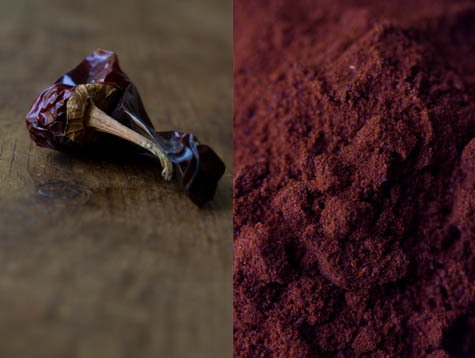 For the sauce, be sure to buy ground red chile, not chili powder - which has other ingredients mixed in. Also, for the vegans out there, this can easily be made vegan by using something like avocado as a topping in place of the cheese. Soak the dried posole overnight in a large bowl of water. The next day drain the posole and place it in your largest thick-bottomed pot along with 3 1/2 quarts/liters of water, the onion, garlic, chile peppers, and oregano. 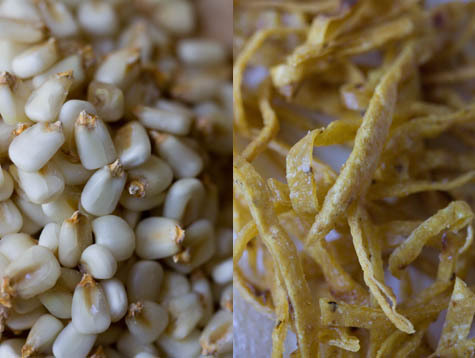 Bring to a boil, then simmer until the posole is tender, and many of the kernels have flowered into popcorn shapes. This can take anywhere from 1 1/2 to 3 hours. Season with a couple teaspoons of salt roughly halfway through the cooking process. Season again once the posole is fully cooked. In the meantime, make the red sauce by combining the olive oil, onion, garlic, and oregano in a medium saucepan over medium heat. Stir continuously until the onion takes on a bit of color, a few minutes. Add the flour and cumin, and stir for a minute or two or until the flour browns a bit. Whisk the chile into 2 1/2 cups / 600ml water and pour it into the saucepan, whisking all the while. Stir until the sauce thickens a bit, dial down the heat and simmer, stirring occasionally, for fifteen minutes or so. Stir in a squeeze of fresh lime juice, and season with the salt, adding more to taste if necessary. Set aside until the posole has finished cooking. Stir 1/2 cup / 120ml of the red sauce into the pot of posole. You can add more red sauce, a bit at a time, until it is to your liking. Spoon the posole into bowls and top with tortilla strips, cheese, and oregano. This recipe was adapted from Vegetarian Cooking for Everyone by Deborah Madison. A vibrant tempeh curry recipe loosely inspired by a recipe from Lora Zarubin's cookbook, I am Almost Always Hungry.